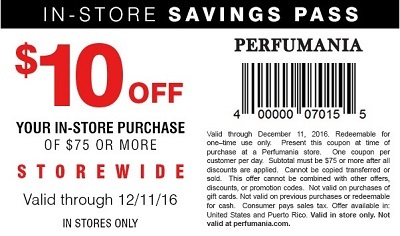 Spend $75 or more at any U.S. Perfumania store location and take $10 off your purchase. Present the coupon at time of your purchase to receive the discount. You can use one coupon per customer per day. Source of the information is Perfumania. The offer is valid until December 11, 2016. For more details visit any U.S. Perfumania store.